I think I’ve mentioned somewhere in my ‘About Me‘ page that out of all my siblings, I earn the least amount of money. They have all carved out hugely successful professional careers and now live the life of well-to-do ex-pats in Hong Kong. Am I jealous of their wealth and success? I can honestly say no, I’m not. In fact, perhaps I’m a little ‘weird’ in that I love to hear how well they are doing, how they’ve expanded their little ‘property empires’ (both in Hong Kong and in London), their numerous exotic holidays and their expensive homes. I was like this even when I was up to my eyeballs in debt – my debt situation had nothing to do with their success after all, it was all my own doing! I have a very good relationship with them all and they don’t go on about their success, or make a big deal of me earning far less. In fact, the only person who does mention our different earning rates is my Mum but she thinks she doesn’t! Earning stacks of cash has never been a huge deal for me – of course, it’s always nice to have more but I’ve never been driven by money. My sisters are into their bling, Jimmy Choo shoes and designer handbags. The designer handbags I own are gifts or ‘unwanted’ items. Anyway, it was my sister’s 40th birthday a couple of months back. Sibling tradition has it that if the person celebrating a special birthday doesn’t know what present they want, they will get something that’s bought by the other siblings. Sis said she would look for some nice earrings and has finally found the pair that she wants. Yep, some very nice earrings. 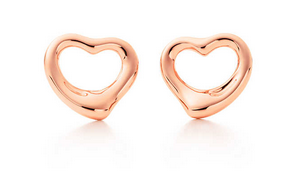 Except they are from Tiffany & Co and cost £570! Yes, £285 each! And the picture above is not actual size as they’re a lot smaller! As the ‘poor relation’, my contribution will be £100…. I have only ever purchased one expensive item and that is a watch which I bought with a bonus I received from work nearly 10 years ago. The bonus also stretched to pay for a holiday in Spain for me and the ex, and paid for the front porch to be fixed. Not a penny of it was saved and none of it was used to pay off the debts I had at the time – what did I know about financial priorities in those days, eh? Bit of a shame, as I can’t see me ever getting such a big bonus again – it was a one-off for a project I did in Stockholm and I don’t travel like that for work any more. So was it £1000 well spent on a watch? Definitely not – my every day watch is a £45 Casio Baby G digital – I wear the expensive one for special occasions. Still, I know for a fact that it’s unlikely that I will ever spend that amount of money for a mere “accessory” again. Anyway, I’m just thankful that there are no more 40th birthdays left in the family, although in several years’ time, it’ll be the start of the 50th birthday celebrations – perhaps I need to start saving up now! I was in Manchester city centre this weekend. I don’t often go unless I have to but I had 3 specific tasks – to pick up my contact lenses, to speak to someone at the bank (in person) and to renew my driving licence at the post office. I parked just outside of town as it was cheaper and so I could walk in as it was a lovely autumn day, warm enough for me to be in short-sleeves, so I guess that’s really warm for Manchester! I walked through the shopping centre, past all the shops and it was nice just to look at what was in the windows without being tempted to go inside, browse and end up buying. I was home by noon, having achieved my 3 tasks and not spent a penny more than intended (my licence renewal was £24, my parking cost £2). I reckon I’m firmly in the ‘Need not Want‘ camp shopping-wise – what I need to curb next however is how much I spend buying presents for people! Wow, I hate that you're practically guilted into contributing to such an expensive gift! It's refreshing to hear that your siblings don't flaunt their economical status towards you. Some people drive for more and more success while others are comfortable with their current earnings. I like to think as long as I can pay my bills, save a little then I should be content. Hi Naomi, I think that's it. I'm pretty content with what I have. Of course, it's always nice to have more but if I don't get it, well, I'm still content. Yes, paying the necessaries, being able to have a good life without having to spend lots, that's contentment for me too! Hi ERG, yeah but at least it's only 'special' birthdays, not every year! Agree, my trips into town are much quicker without having to stop in shops! Gift giving and receiving is something I struggle with. I would happily knock it all on the head (apart from my kids). We celebrate Christmas and I think it would be much nicer to skip the presents all together and just have a lovely family dinner, but my extended family freak out when I bring the subject up. As for birthdays we give say a £20 voucher to someone and then they reciprocate – what's the point!! Hi weenie, it's great that you can go out and enjoy the shops without feeling that you need to spend, and that you can enjoy the fact that your sisters get their bling without wanting it yourself. I've never really understood the attraction of jewellery, handbags or shoes (especially if they're the kind that break the bank) but I have been known to spend a little more in Monsoon than is strictly necessary. I am cutting down my spending on clothes though and making a big effort to ask myself if I really need something rather than just want it. An exercise I have taken to trying if I find myself tempted by a new dress, especially if it's something to "go out" in rather than for work, is to consciously work out how much some of the old ones in my wardrobe have cost me "per wear". It's very sobering to think that you can spend £60 on a dress and then only end up wearing it twice – £30 per outing! Shameful. Hi Cerridwen, I hear you on the dresses! For a dress which I bought recently for one of the weddings I attended last month, I had already made a mental note that it could be worn again for at least one Christmas outing! As it's rather figure hugging, it's also a good incentive to help keep my weight down as I need to get back into it haha! Hi Laura, as two of my sisters have kids, they too have been added to the gift giving list so the cost is growing! Actually, I don't mind giving and receiving vouchers – they give me a chance to buy things I wouldn't normally want to spend money on! A couple of years ago we told the extended family not to buy us birthday or Christmas presents. We said we would also stop buying presents, apart from for the kids. Most family members were fine with this. We then suggested that we would not buy the children pointless presents. We decided that we would do things with them instead. This has worked really well and it's great spending time with the extended family. Our ideal Christmas is no presents but time with all the special people in our lives. Much nicer than stacks of pointless stuff. It sounds a bit crazy, but it works for us. Hi BM, I try to get stuff like books and craft kits for my sisters' kids, rather than toys so it's something fun and educational. I also put a little something in trust funds for them each birthday. Spending time with family is much more important I agree, but traditions are hard to change! Less pointless stuff is the way though!